Motor Home Specialist is the #1 Volume Selling Motor Home Dealership in the World. Over $165 Million Dollars to Choose From. New RVs from $17,999 Travel Trailers to Over $2,000,000 Bus Conversions and Every Type & Price-Point in-between. No Games. No Gimmicks. Upfront Pricing on Every Make and Every Model. Minimum 25% Off M.S.R.P. on All New Motor Homes. Visit MHSRV.com or Call 800-335-6054.<br />12-10-18 <a href="http://www.mhsrv.com/entegra-rv/"><img src="http://www.mhsrv.com/images/sold-entegracoach.jpg" width="383" height="141" border="0"></a> MSRP $144,016. Something Huge Has Happened in the RV Industry! 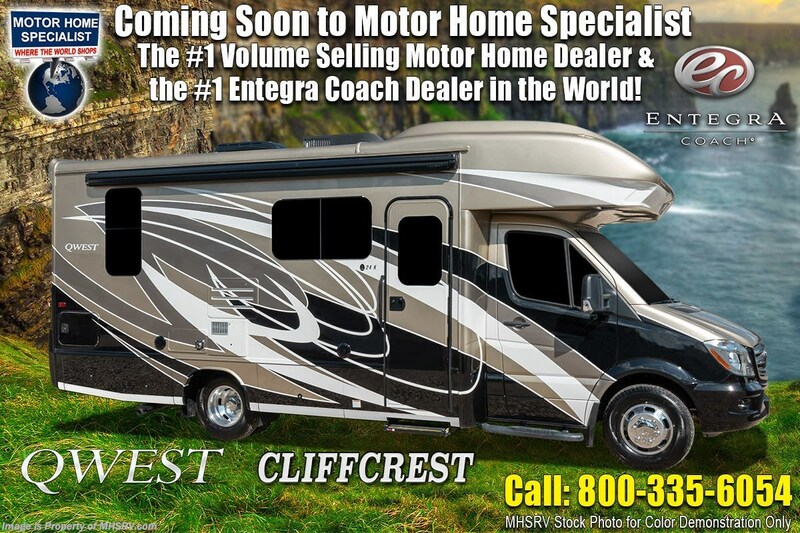 One of the premier luxury motor coach manufacturers in the world is now offering luxury class C RVs with Entegra Coach&apos;s legendary 2-year limited warranty! 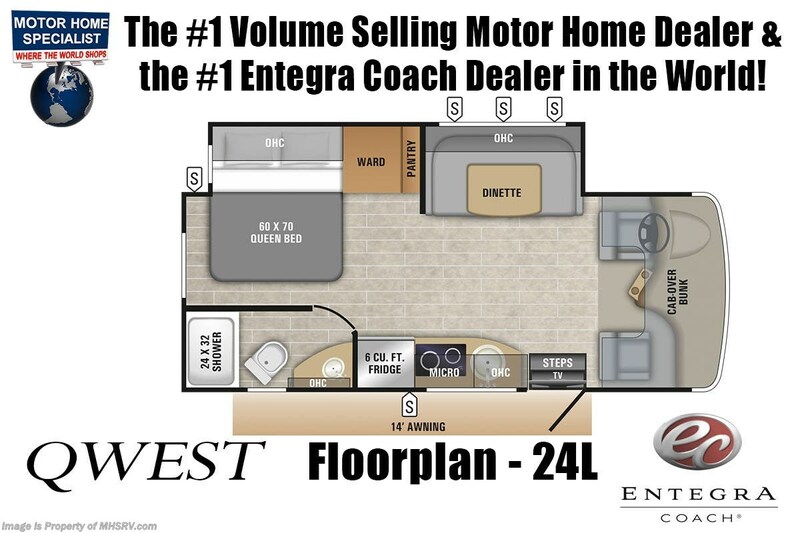 The Entegra Qwest Class C RV Model 24L is approximately 25 feet 2 inches in length and features a one piece seamless fiberglass roof, 1,000 watt inverter, one-piece seamless front cap, Ultraleather furniture, throughout, JBL premium sound, day/night roller shades, Mercedes 3500 chassis and a V-6 Turbo 188HP diesel engine. This amazing RV also features the Customer Value Package option which includes a backup camera, electric awning with LED lights, framless windows, infotainment center, keyless cab entry, power heated mirrors, stabilizer jacks, driver & passenger swivel seats and tank heating pads. This beautiful RV features the optional sun folding windshield shade. For more complete details on this unit and our entire inventory including brochures, window stickers, videos, photos, reviews & testimonials as well as additional information about Motor Home Specialist and our manufacturers please visit us at MHSRV.com or call 800-335-6054. At Motor Home Specialist, we DO NOT charge any prep or orientation fees like you will find at other dealerships. All sale prices include a 200-point inspection, interior & exterior wash, detail service and a fully automated high-pressure rain booth test and coach wash that is a standout service unlike that of any other in the industry. You will also receive a thorough coach orientation with an MHSRV technician, an RV Starter&apos;s kit, a night stay in our delivery park featuring landscaped and covered pads with full hook-ups and much more! Read thousands upon thousands of 5-Star Reviews at MHSRV.com and see what they had to say about their experience at Motor Home Specialist. Why Pay More? Why Settle for Less?